The final collaboration between Rodgers & Hammerstein was destined to become the world's most beloved musical. When a postulant proves too high-spirited for the religious life, she is dispatched to serve as governess for the seven children of a widowed naval Captain. Their ensuing romance is interrupted by the outbreak of WWII and is highlighted by some of the most recognized songs in musical theater history. "This Sound of Music Rings True"
CHERI DEE MEGA (Mother Abess) is delighted to be in her first speaking part! You may remember Cheri as Cousin Melva (pianist) in SMOKE ON THE MOUNTAIN. Cheri has been musical director or pianist for numerous productions at CATS and Artisan Center Theater and was the Music Director for the launch of PlazaCo With GOOD MAN…CHARLIE BROWN. Favorite previous involvements include BIG RIVER, GODSPELL, SEVEN BRIDES FOR SEVEN BROTHERS, BEST CHRISTMAS PAGENT EVER, WIZARD OF OZ, and JOSEPH AND THE AMAZING TECHNICOLOR DREAMCOAT. She teaches private Piano, Guitar, and Voice. Cheri would like to thank her husband, Brian, for letting her play at this very fun hobby. Thank you most of all to Jesus for energy and the grace to keep going and to Him be all glory. DARON COCKERELL (Sister Sofia, ensemble) is thrilled to be working with such a talented group of actors, especially the rocking nun chorus! You may have seen Daron as Olga in YOU CAN'T TAKE IT WITH YOU, Eliza in MY FAIR LADY, Belle in BEAUTY AND THE BEAST or Martha in THE SECRET GARDEN. Daron is blessed to be able to do this show with her sister, mama and daddy...and now just needs her brother to give in and audition for a show here too! She thanks JaceSon and Tina, as always, for allowing her to be part of their show, and thanks her family and friends for their endless support. DEVLIN POLLOCK (ensemble) is back for his second show after playing in FOOTLOOSE. From Alvarado, TX, Devlin enjoys being a sophomore, marching the AHS marching band, attending early morning scripture study class. He especially would like to thank his parents for letting him perform during the school year. "Thank you Mom and Dad for all your support!" EDEN BARRUS (Gretl) is happy to be back on the stage. Eden has played many parts here at PlazaCo including Woodstock in GOOD MAN…CHARLIE BROWN, a lamb in BEAUTY AND THE BEAST, and various child ensemble roles in other shows here. ELOISE FLETCHER (Gretl) is excited to make her acting debut on the Plaza stage. Eloise enjoys singing and playing games with her family. ETHAN FLETCHER (Fredrich) is having a great time at Plaza Theatre. Previous stage experience include playing Scrooge in A DICKENS OF A CHRISTMAS at Smith Middle School. Ethan enjoys playing Tennis, reading scriptures, and hanging out with his family. JAY LEWIS (Capt. Von Trapp) was most recently seen on the Plaza stage as Rev. Shaw Moore in FOOTLOOSE. He was also seen on this stage as Doolittle in MY FAIR LADY and Maurice in BEAUTY AND THE BEAST. With the Cleburne Carnegie Players, Jay has enjoyed playing various roles such as Fagin, Tevye, Daddy Warbucks and King Arthur. Jay is surrounded daily by 500 kiddos as the principal of Gerard Elementary. He is excited about directing DISNEY'S BEAUTY and the BEAST for the Carnegie Players in summer '09. JULIANNA KELLER (Brigitta) is delighted to be back at Plaza Theatre Company after being in MY FAIR LADY, Mary in THE SECRET GARDEN, The Ghost of Christmas Past in THE CHRISTMAS CAROL, and the Pie Server in BEAUTY AND THE BEAST. Previous stage experience includes, TINY THUMBELINA, THE LION, THE WITCH AND THE WARDROBE, and THE WIZARD OF OZ at C.A.T.S., and many others. She is currently working on an independent film and has had the leading role in several Graduate films at USC and UCLA. Julianna has performed stand-up comedy in a Disney production at the LA Improv Comedy Club. TV: She has appeared on ‘Desperate Housewives’ and Two-and-a-Half Men. Recently, Julianna booked two J.C. Penny Commercials. She was chosen as one of the top 20 ‘triple-threat’ youth performers in the Dallas area. She is a 5th grader at Trinity Valley School. She loves performing and loves horses. She plans to be a Veterinarian someday. LAUREN ATWELL (Marta) loves to perform and is particularly fond of the Plaza stage! Her previous shows include BEAUTY AND THE BEAST and her favorite role of Tiny Tim in A CHRISTMAS CAROL. Lauren attends acting classes at Plaza and has previously taken classes at TAFA and Casa Manana. Aside from theater Lauren enjoys gymnastics and dancing. She is especially proud of her family which includes her new baby sister, Morgan! LEANNE MEPPEN (nun, ensemble) is back at Plaza again after playing Essie in YOU CAN'T TAKE IT WITH YOU. Hailing from Granbury, this High School Deaf Education teacher has only recently caught the acting bug. While she was recently seen as Elsa in SOUND OF MUSIC at Stone Gate Christian Academy/Longhorn Theater, she has assisted with several shows at Granbury High School. To round out Leanne's full and blessed life, she enjoys singing on the Praise Team at her church and reading. Leanne would like to thank her Lord and Savior for all He has blessed her with! To her family and friends, "Thanks for supporting and encouraging me in this newest adventure in my life!" MEREDITH BROWNING (MARIA) is thrilled to be making her debut with Plaza, and especially to be sharing the stage with her daughter, Rachel.Meredith has performed extensively in operatic and classical venues including Fort Worth Opera, Opera East Texas, Living Opera, and Seagle Music Colony in New York. Her favorite roles include Yum Yum in MIKADO, Adina in ELIXIR OF LOVE, Frasquita in CARMEN, Rapunzel in INTO THE WOODS, and Mozart heroines Donna Anna and Fiordiligi. Meredith studied voice at Abilene Christian University and Boston University. Upcoming local performances include AMAHL AND THE NIGHT VISITORS with Fort Worth Opera, and the soprano soloist in Verdi’s GLORIA at St. Luke Cumberland Presbyterian Church.Special thanks to husband, Tyson, and son, Simon, for indulging the musical passions of the girls in the family! MILETTE SILER (Elsa) is on stage again. Most recently as Olga in YOU CAN'T TAKE IT WITH YOU, milette also playing Eliza in MY FAIR LADY,Pamela Wright in THE MAN WITH THE POINTED TOES,Martha in SECRET GAREN last fall. Milette would also love to thank her wonderful, loving family for all their support and sacrifice letting mommy play her dream role. To Dana, Ryan, and Mitch: you are my greatest joy! PARKER BARRUS (Fredrich) has been in a few shows here at Plaza. You may remember him as Collin in THE SECRET GARDEN. He is also currently playing Ruby Sideburns in the Lolly-Pup's Roundup show BLACKBEARDS BIRTHDAY BASH. Park is an inventor (better keep an eye on the blue tape) and a professional big brother. He sends loves to Tabby, Cam, Edie and Mimi. PATTI COCKERELL (stage manager) is thrilled to be working on her second show at Plaza Theatre Company. You may have seen her hitting light/sound cues for BEAUTY AND THE BEAST. You will see her again (or not see her) in the upcoming CHRISTMAS CAROL. She thanks her daughter Daron for encouraging her to try something new. She is delighted to have three members of her family in this show...Daron, Bree and her husband Tom. Thanks to JaceSon, Tina Aaron and Milette for their help and friendship. PRISCILLA NIX (Sister Berthe) is excited for her first performance at Plaza Theatre Company and thrilled to be playing Berthe. She has loved the music since she was 5 years old and used to play the album everyday. Priscilla always dreamed of being a nun, but since she his happily married to husband Richard, she is glad to be playing one on stage instead. Priscilla currently lives in Cleburne and teaches at Smith Middle School. Has 2 step-sons, Jamie & Jeremiah and is the 7th of 9 children. "My mother always dreamed of having a family as big and musical as the Von Trapps! Thank you to my family and friends for all of your love and encouragement!" RACHEL BROWNING (MARTA) is a second-grader at Christian Life Prep. She is so excited to be doing what she calls her “first real role,” but her family knew it was only a matter of time since she’s been singing ever since she could talk! Rachel has been studying dance and piano for several years, creating and performing her own shows for family and friends, and singing for any willing audience.Last year, Rachel was selected to sing the part of the angel in her church Christmas musical. A big thank you to Plaza for giving her this part in one of her favorite shows! REBEKAH KRAJEWSKI (Liesl) is thrilled to be performing in her first show here at Plaza Theatre Company! She most recently played Antonia in MAN OF LA MANCHA at Carnegie Theatre, her first on-stage role. Rebekah’s greatest passions are singing and acting and she plans on pursuing a degree in musical theatre. She would like to thank everybody here at Plaza for welcoming her with open arms and making her feel right at home, and hopes to be a part of many more shows to come! STEPHEN SINGLETON (Rolf) This is Stephen's fifth appearance at Plaza and he's thrilled to be working with JaceSon and Tina yet again. He's been Ben Whitledge in NO TIME FOR SERGEANTS at artisan and been in many shows here at Plaza the last being SOMKE ON THE MOUNTAIN WHERE he played Jethro the guitarist. Stephen enjoys playing guitar, piano, violin, and singing. "The steps of a good man are ordered by the Lord, and He delights in his way." "I will follow Him in everything that I do." Thanks to Curt, Joey, and Buddy for being other brothers. Thanks to Mary, and Michelle for being other sisters. Also, thanks to Geisels, McElrees, Cheri, Mom, Dad, Michael, Tim, Beka and all those that are and aren't here you are dear to my heart, and Jesus Christ thank you for always being there. 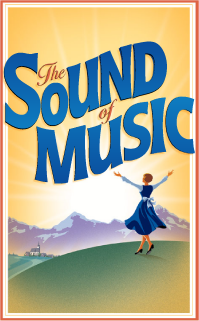 TOM COCKERELL, JR. (nazi, priest, ensemble) THE SOUND OF MUSIC is Tom's first experience on stage. However, for a number of years he has enjoyed music and theater vicariously through his daughters Bree and Daron and his son Jameson. Since his wife, Patti, is the stage manager for the production Tom basically needed something to do while everyone else was busy at Plaza. Tom's entire family is musically talented, having participated in a wide variety of theater and performance. All of the family was encouraged to do theater by his mother who was an acrobat in a circus. Tom thanks the Plaza management for this opportunity.